Introduction: Fundamentals of Laparoscopic Surgery (FLS) is considered a validated educational module for basic laparoscopy. Recently, FLS and its testing have become available at no cost for all general surgery residency programs. Unfortunately, there are a relatively limited number of testing sites. This investigation studied the hypothesis that the technical skills portion of FLS test could be graded live over the Internet. Methods: The FLS technical skills test was administrated and graded by a live observer (a FLS certified (proctor). Two camera feeds were simultaneously transmitted via teleconference software through the Internet. One feed was directly to the FLS box and the other feed was a standard webcam set up to view the test taker. An away observer (a laparoscopic surgeon with vast experience in teaching FLS) viewed the feeds from a site away from the test center. Both live and away observer recorded times via the live feeds. The endoloop and the two tied sutures were measured by the live grader. Both the circle and the gauze (for the pattern cut exercise) were photocopied before the live observer graded the task. The photocopies and the sutured materials (after being numbered) were placed into a bag to be sent to the away observer. Results: Ten sample tests (50 sections) were administered included in this study. During one of the sections, there was an issue with the Internet connection which was not included in the study. The overall correlation was extremely high for overall score (r = 0.997; p < 0.0001) and time (r = 0.9996; p < 0.0001). More importantly, the overall score and time never differed more than 1 and 3 respectively between live and away observers. Penalties were measured similar by both observers as well. All five sections had high correlations between live and away observers. 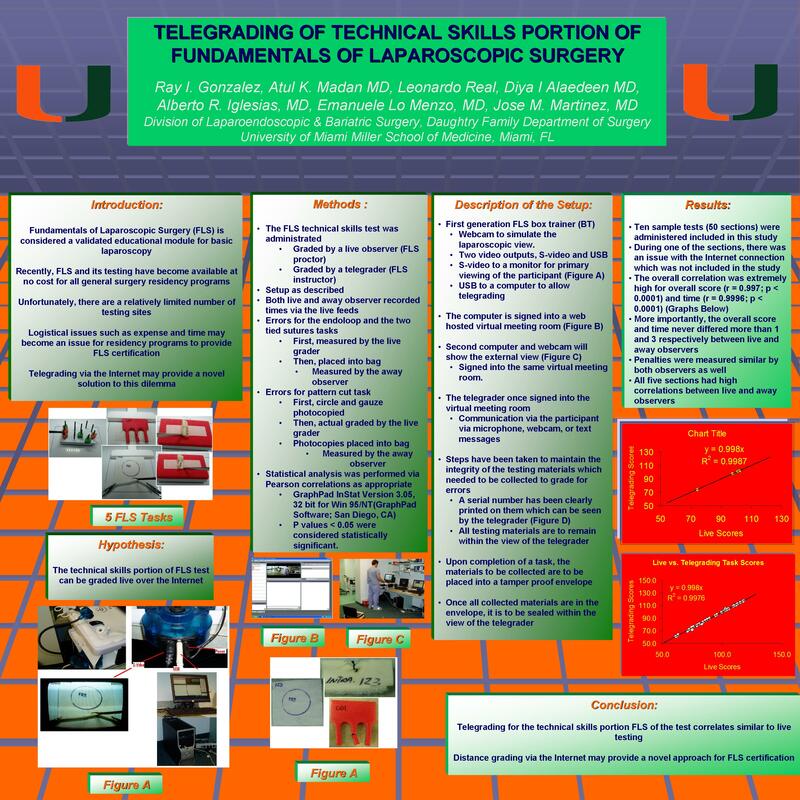 Conclusions: Telegrading for the technical skills portion FLS of the test correlates similar to live testing. Distance grading via the Internet may provide a novel approach for FLS certification.